The name of the small town of Snowflake might hint of severe winter weather in this high desert location, but it derives instead from two Mormon pioneers, William Flake and Erastus Snow, who established a settlement here in 1878. The town is mostly surrounded by flat, arid, treeless plains, 20 miles north of the higher, forested country of the Mogollon Rim, though the east edge borders a belt of irrigated land, either side of Silver Creek. Highway 77 is the main access route, between Show Low and Holbrook, together with Hwy 277 from Heber and the west. A couple of hotels and the only supermarket in the area (Basha's) can be found to the south of town, half way to the adjacent community of Taylor. 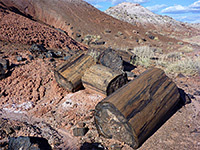 The nearest major tourist attraction is Petrified Forest National Park, 44 miles away via Hwy 77 and US 180. Open late 2018, Best Western Snowflake Inn is situated in a semi-rural neighborhood at the south edge of town, close to the adjacent community of Taylor. The inn offers free breakfast (with a few hot items), an indoor heated pool, hot tub, fitness center & meeting room. Most guest rooms contain a refrigerator & microwave, while a few have a whirlpool bath. A shopping center half a mile south includes a selection of restaurants, Bashas' supermarket and a Walmart superstore.